An Evening of Responsible Luxury was organized to raise support for girl child education by Smile Foundation at the Hyatt Regency, New Delhi. The event was successful in bringing hundreds of girls into the fold of education under Smile Foundation's Mission Education programme. 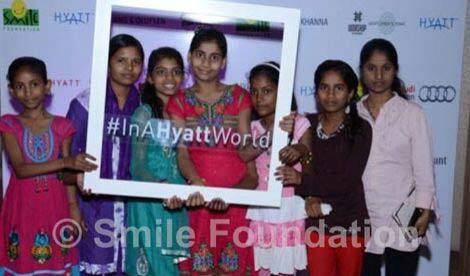 We heartily thank Hyatt for supporting the event and Ravish Kapoor Innovative Invitations for partnering with us. And Shivani Wazir Pasrich for making the evening really special! Also a big thank you to all the artists, and Ravissant, AirFrance-KLM, The 'V' Renaissance, Rang Mahal, Jaisalmer, Rajasthan, India, Grand Hyatt Dubai, FARAH KHAN FINE JEWELLERY, KitchenAid, Bang & Olufsen India, Vikas Khanna, Archana Kochhar - An ace couturier, Audi Gurgaon, and Worship Salon and Gentlemen's Tonic for their contribution.